Whoo-hoo! This is very exciting as it's my first card as a Design Team Member at the Cuttlebug Challenge Blogspot. I'm incredibly humbled to be a small part of their fabulous BLOG that continuously provides endless inspiration! 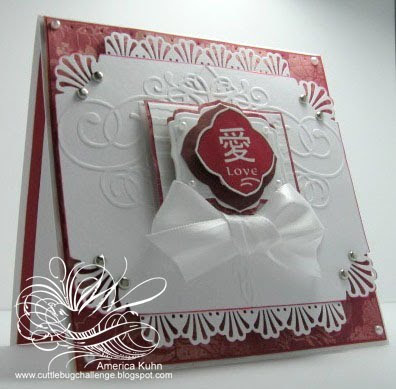 This week's Be Inspired Wednesday #65 Cuttlebug challenge is an ASIAN Theme with white as the main BG color! For My card, I tried to go with CLEAN AND SIMPLE (CAS) for the OCC Challenge at "Our Creative Corner" & the (CAS), #CAS48 - Happy Valentine's Day at SCS ...However, and for some funny reason, my need for panel layering always seems to get in my way of achieving true CAS cards. LOL. Ink: Marvy Matchables & inking edges)& SU White Signo Gel Pen (for highlighting love panel edges). Okie Ladybug, Sandee Shanabrough, Odette Martinez, Jana Eubank, Ellen Sosnoski, Deborah March, Carla Peicheff, America Kuhn (me), Anja Curvers, Tammi Skinner, Cindy Royal, Terrie Bailey, Shantaie Fowler, Mel McCarthy, June Houck, Jackie Gallagher, Beth Ullman, Cassie Larson, Meda Halmaciu, Nathalia Castellon, Stamping Maggie & Karen Maldonado. What a line-up heh? Thanks so much for looking & for your great support! YOU inspire ME!!! I see I have been missing out on a lot lately! Congrats on your new DT positions!!!! I am SO happy for you! You do such amazing work. What a gorgeous card! just gorgeous! Oh my gosh!! Congratulations, America!! That is awesome!!! I just LOVE this card!!!!! This is just sooo beautiful, America!! I love the wonderful border and the rich colors!! This is gorgeous America!! I love your use of the punches and the clean white embossed layer. I have a difficult time with not doing layers also!! Wow, what beautiful cards! I am so happy to have found your site through Becca's. I love Cuttlebug and Spellbinders, so I will be visiting often. Welcome America to the DT can see from your gorgeous card you are going to be a great asset to the team I love the simplicity of your card the clean white backgrounds with just a splash of color wonderfully done. BEAUTIFUL America!! I'm so happy you're on th design team! This is a really beautiful card! I love the embossing and the red and white. Wow America!!! Congratulations!!! I'm so happy for you... you totally deserve this honor and you will do awesome work for them! I love your white layers... love what you did with the edge punch and that embossing folder is gorgeous!!! Whoo hoo! You go girl!! !